The beheading of 21 Coptic Christian Egyptians by ISIS on February 15 has triggered widespread international official condemnation. Human Rights Watch has condemned this atrocity as a war crime. However, the language is sufficiently opaque as to leave room for missing the point of who these civilians were and why they were targeted: “Egyptians – particularly those of Coptic faith and truck drivers carrying goods back and forth from Egypt – have been targeted for abduction or killing in Libya around a dozen times since late 2013”. Invoking Copts and truck drivers (even if non-Copt) implicitly suggests that they are both vulnerable to abduction and killing. Is this framing informed by an absence of knowledge of what is happening in Libya, or strategic - intended to underplay the explicit targeting of civilians on religious grounds? An audit of the incidents of kidnappings that were announced in the Egyptian press since 2013, most of which were confirmed by the Ministry of Foreign Affairs, gives an unambiguous picture of what is going on. Compiled by Akram HabibLibya has for many decades been a country which has received hundreds of thousands of Egyptian migrants in search of livelihoods. While not all Egyptian residents in Libya are low income earners, it is likely that the majority are. Certainly, the twenty one beheaded Egyptian Christians fit that category. They came from a remote village in Minya, one of the Upper Egyptian Governorates with a low human development profile and high levels of poverty. Many Egyptians, Copts included, have often held low paid menial jobs in Libya, whether as day labourers or street vendors, with their poverty increasing their vulnerability. However, even when they are not in economically vulnerable situations (such as the doctor and his family who were murdered, see table above), they have still been targeted. 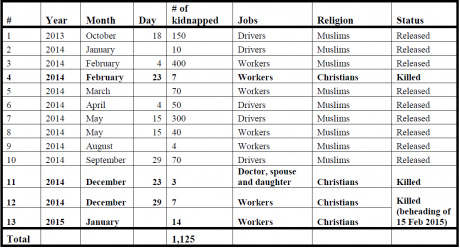 From the table above it is clear that of the 1,125 cases of kidnapping, only the Christian have been killed (though there may be more who were taken hostages, the whereabouts of which are unknown, undocumented in the media). This comparison of the predicament of captured Egyptians suggests that there is a pre-meditated plan of eliminating those who happen to be Copts on the basis of religion. The selective killing of the Copts, and the release of the others can only be explained by the will of the assailants. The BBC for example, reports that eyewitness accounts in one incident of kidnapping involved the armed group which dashed into a house full of Egyptian workers and asked whether there were any Christians among them, seized them, and left the rest. In view of the long history of Egyptian Christian migrant labour to Libya, why are they being targeted now? Writer Salwa El Zoghby provides an astute analysis of the main drivers of the religiously-mediated targeting. She suggests that these attacks have taken place predominantly in the centre and east of Libya which are areas characterized by the near absence of state authorities, prevailing chaos, absence of rule of law and widespread circulation of weapons. It is in these areas that Islamist militias have established strongholds, and found the conditions that have empowered them to target Christians on ideological grounds. She also points that these Islamist jihadi groups have been responsive to the announcement by Ansar Al Sharia ( Libya) in February 2014 of an economic reward for anyone who clears Benghazi of any Christian presence. There is also a performative dimension to how ISIS has captured the beheading of the Copts on video, in line with its other videoed assassinations in Iraq and Syria. By beheading Egyptian Christians, as opposed to their Muslim counterparts, ISIS assumes (wrongly) that it is not alienating Muslims and is only enforcing their message of zero-tolerance policy towards those whom it believes to be infidels. Certainly all of Libya has suffered as a consequence of the disintegration of any functional state, the country now being the centre of geopolitical power struggles between different contenders: the US, Qatar, Saudi Arabia, Italy - and the list goes on. There is also a vendetta between the Egyptian leadership and the Islamist movements which has its roots in the overthrow of President Morsi through a popular uprising that was followed by military intervention. There are a number of concentric circles which are underpinned by complex historical and contextual power dynamics that have spill over effects on socio-political relations on the ground. However, to reduce the transparent targeting of Copts on religious grounds to an unfortunate fallout of a messy and chaotic situation is to deny the diffusion of an ideologically driven political project which is intended to clear the middle east of its religious minorities, and liquidate religious pluralism. Christians, being the largest religious minority in the middle east, become an obvious target, though not the only ones. There are strong resonances in the modalities of religious cleansing deployed by varied Islamist militant groups and ISIS in Iraq, Libya and Syria. The kidnappings, imposition of ransoms, the ultimatums of conversion to Islam or death in Syria and Iraq, have amounted to religious and ethnic cleansing according to the UN. A recently released UN report produced by the UN body responsible for reviewing Iraq's record for the first time since 1998, denounced "the systematic killing of children belonging to religious and ethnic minorities by the so-called ISIL, including several cases of mass executions of boys, as well as reports of beheadings, crucifixions of children and burying children alive". So where does this leave us? In speaking with some progressive academics, social justice advocates, human rights activists, I have sometimes noted a certain reluctance to recognize this phenomenon as ideologically driven, or to analyse the particular modalities of violence identified above as associated with religious targeting of non-Muslim groups in the Arab world. This is not due to lack of evidence (UN, Amnesty International and others have released reports, UN officials have already spoken of a genocide in Iraq), but to the invisibility of the nature of these outrages in our debates. I do not claim to understand why, but here are some propositions. First, many proponents of post-colonialism have repeatedly reminded us that colonial powers have used the “religious minority card” in order to divide and rule. Moreover, in some instances the entanglement of missionary movements with the imperial powers’ political agendas, and their privileged position in society, has left a rather infamous legacy of Muslim-non-Muslim relations. However, this history has left a number of unfortunate imprints on contemporary discourses around religious minority matters in Muslim majority contexts in the middle east. The first is that it generates the false assumption that the middle eastern Christians are all remnants of the missionary movement, rather than ancient denominations founded in the first four centuries AD. like the Copts, predating missionaries by millennia. Second, it ignores the very ancient non-Abrahamic religions whose ancestry goes back thousands of years and who are also at risk of extinction (the Zorastrians and Yazidis being cases in point). Could this past generate a reluctance to raise issues of religious diversity in case they smack of support of neo-colonialism? Second, many progressive western activists and thinkers are rightly conscious of their positionality - namely how they are perceived in the Arab world. There is a fear among some that appearing to be defending religious pluralism in the middle east would be equated with the American hegemonic project, often perceived to be strongly aligned with right wing Christian lobby groups. However, it is precisely the role of the US in aligning, supporting and nurturing militant groups in Libya, Iraq and Syria as a catalyst for the current existential threat to religious diversity in the region that we need to bring to the forefront. There is no longer a “western us” versus the “Muslim rest” – the entanglements of the US in deals and manoeuvrings with Islamist militants, not least in Libya, Syria and Iraq cannot be overlooked. Finally, our dread of Islamophobia at a time when right-wing political parties with racist overtones are on the rise in Europe, should not allow us to be cowed into the avoidance of anything to do with the “Islamic zone” in the name of political correctness. This reluctance to differentiate between the followers of the faith, and those who mobilize violently in the name of religion, may be a basis for exercising self censorship. It is what Bassam Tibi has termed Islamophilia: refraining from criticizing political Islamist groups so as not to offend. One classic example of this is raised by Professor Elizabeth Prodromou, who argues that there is a reluctance to talk about the contemporary political project of the instatement of an Islamic Caliphate. She argues that skeptics from the middle east have been concerned understandably that the subject of ISIS formation of a new Islamic Caliphate “is freighted with neo-Orientalist attitudes and neo-imperialist designs, and critics in the US scholar-practitioner community have worried justifiably about the neo-conservative and neo-liberal ideological posturing and policy blowback embedded in the topic. However, considered skepticism and principled criticism need not foreclose historically-informed analysis and prudent policy planning”. We need the courage to reflect, discuss and debate how we can carve a space that would allow us to engage with religious pluralism issues in the middle east head on, without equivocation, and without falling into the traps of easy stereotypes and reductionistic explanations.